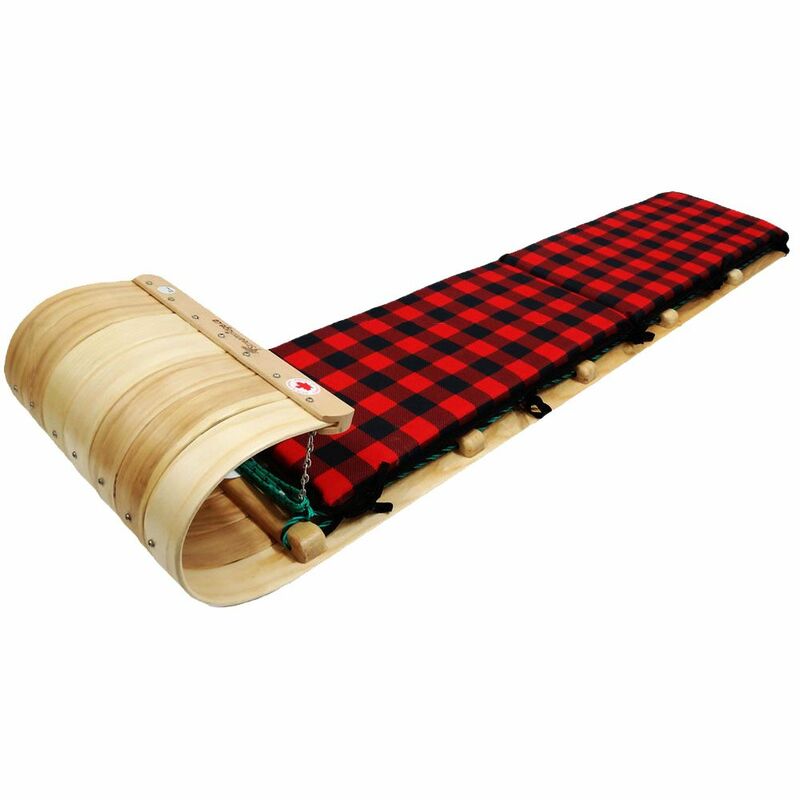 Blast down the sparkling white hills with the whole family on the Frontier Blast 6ft Toboggan with Plaid Pad by Streamridge<sup></sup>. Handcrafted from Ontario ash hardwood and assembled from tip to tail with strong screws (not weak staples) for strength and durability. Designed to be passed along through generations. Features a rounded header and rounded crossers for maximum comfort. Coated in a clear, water-based, eco-friendly protective finish. The premium, green braided pull rope is easy on your hands and makes the trip up hill easier as well. A sharp-looking polyester pad provides maximum comfort, and adds great style to this fun toboggan. Hand-sewn from tough, 600 denier polyester. Attaches easily with strong, double-stitched tie straps. The Alpine Racer $56 is a high quality downhill sled, built to withstand rugged hillside adventures. Ideal for lightly covered snowy surfaces. Use your legs to make it turn and enjoy a wonderful winter outdoors! This side by side sleigh easily doubles the fun! Ontario Ash Hardwood construction includes an extra side rail for hoop and runner support with metal wear bars for years of use and easier gliding. The .5" thick pad made with waterproof polyester fabric adds a rustic plaid colour and provides a smooth, comfortable ride. Frontier 6 Feet blast Toboggan with plaid pad Blast down the sparkling white hills with the whole family on the Frontier Blast 6ft Toboggan with Plaid Pad by Streamridge<sup></sup>. Handcrafted from Ontario ash hardwood and assembled from tip to tail with strong screws (not weak staples) for strength and durability. Designed to be passed along through generations. Features a rounded header and rounded crossers for maximum comfort. Coated in a clear, water-based, eco-friendly protective finish. The premium, green braided pull rope is easy on your hands and makes the trip up hill easier as well. A sharp-looking polyester pad provides maximum comfort, and adds great style to this fun toboggan. Hand-sewn from tough, 600 denier polyester. Attaches easily with strong, double-stitched tie straps.